After a slow, lazy start to the day, we set off. There are a series of rapids actually marked on our topo maps — none of yesterday’s crunchers warranted a mention — so we approach with grave trepidation, expecting big adventure for the day. As usual, the worst thing about it is the anticipation. The South Saskatchewan is notoriously low this year, giving us lots of shallow water, but the North Saskatchewan is running high so all the rapids are drowned, churning up nothing but boils, standing waves, and anxiety. We fly along on the booming current for another 70 kilometres to a provincial campsite. We see our first black bears : two cubs that scamper up a tree at the sight of us, while Mama thrashes around impressively in the bush below. Our campsite is only about half a kilometre farther along, but thankfully they do not pay us a visit. The mosquitoes are another matter! We wake to find the Ambrose Jane afloat, though we pulled her well up last night. The tent is within a few centimetres of floating, too — the fluctuating river level controlled by the Finlay Dam, close downstream. It’s Monday today, but every day is starting to feel like Sunday. We’re finally losing that workaday mindset — yippee! 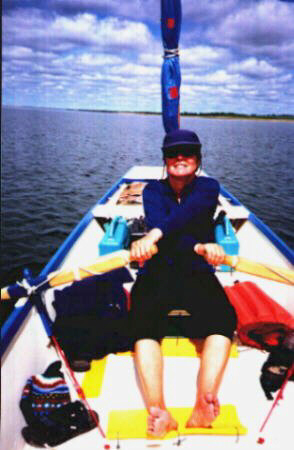 We row and sail the 40 km length of Cadotte Lake in one long day. And thank heavens, because the lake is only about 15 years old and we see, count ’em, just ONE half-decent stopping place along the whole log-and debris-littered, crumbling-dirt-bank shoreline. It would be downright dangerous if one of those unpredictable prairie winds blows up. But we make it to Findlay Dam, just outside of Nipawin, in the afternoon, and face our next portage. Sylvia hams it up with her revolutionary new rowing technique. It looks like it could be a nasty lot of work, but fortunately Sylvia has been in touch with SaskPower to arrange some help. Brian and John show up right on time, with pick-up trucks and muscles, and forty-five minutes later, with just a few dings to the Ambrose Jane, we’re back in the water again on the downstream side of the dam. Portaging deluxe! Sure beats a five-hour slog, especially when we discover later that one of our boat wheels has gone flat! Sylvia’s cousin Derrek, who lives in Nipawin, has a day off and he spends it chauffeuring us around town doing errands, laundry, and lunch. What a big help! Being the local Alliance Party MP, he also has connections with the newspaper and arranges an interview. We hear about an adventurer type who came through a couple of weeks ago by motor skiff. He took something like ten days to go from Edmonton to Lake Winnipeg — on our trip, the equivalent distance will take two months, if we’re lucky! According to the reporter, he also aborted his trip at Lake Winnipeg because it was too rough. Uh-oh … what are we getting into? Then we also hear about the troublesome “disappearing river” behind E.B. Campbell dam, which we’ll get to a few days hence. Yikes! Why haven’t we heard about this before? We get back to the campsite to discover that squirrels have chewed a hole in one of our waterproof food bags. The wilderness is closing in…. about, as apparently there is a big walleye derby coming up. When we hear about the $50,000 prize money we begin considering a career change. Tobin Lake starts off narrow enough but quickly becomes big and scary: up to 10 km wide and very shallow, so any wind kicks up treacherous waves. In addition, when they built the E.B. Campbell dam they neglected to clear out the reservoir beforehand, so there are a lot of deadheads, debris, and flooded shoreline that we were warned about with relish. Campsites are hard to find, and with dusk well advanced we anchor the boat in a reed-ringed bay and think about spending our first night aboard. We even get so far as to set the tent up in the boat — a bit of a squeeze but it fits, sort of — when a lowering sky threatens rain. We have no desire to sleep in a boat/bathtub full of water. Finally we ram the boat ashore in the willows and kick down a flat spot big enough for the tent. Good thing, too, for it rains like Judgement Day all night! turns into a great day, with clear skies, cool, clear water, and a lovely sailing breeze that pushes us alongshore past an old-time jug band camped out for practice time, and on to The Perfect Campsite. It’s got mowed grass, a homemade picnic table and shelter, a sandy lake bottom, and a great view of the other side of the lake, 4 km away, where we hope to get to in tomorrow morning’s early calm. Oops, did we say “perfect”? It was, until the mosquitoes came out….